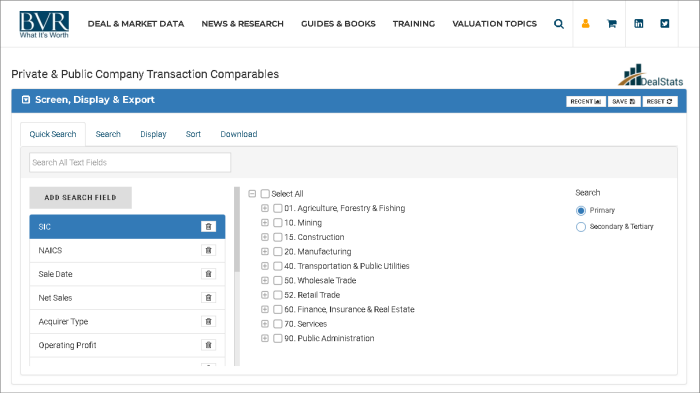 This summer, BVR revolutionized comparable transaction analysis with the launch of DealStats, the new platform taking the place of the Pratt’s Stats database. Pratt’s Stats has been known for decades as the quintessential source for data on private M&A transactions. Since 1997, it has gathered financial details on private-company acquisitions from a global network of business intermediaries and has provided business appraisers and other financial professionals an objective reference point when benchmarking or valuing businesses. DealStats merges Pratt’s Stats and Public Stats transactions into one powerful platform and is sure to delight users with new state-of-the-art search capabilities, additional data fields, easy saving and report generation, and much more. “Pratt’s Stats was long overdue for a major upgrade, and DealStats is a remarkable improvement. It is faster, more robust, and fully customizable,” says Adam Manson, director of valuation data at BVR, who spearheaded the development of DealStats. The first thing you’ll notice in DealStats is a new modern look that is vastly more user-friendly and flexible. But this is not just window dressing. 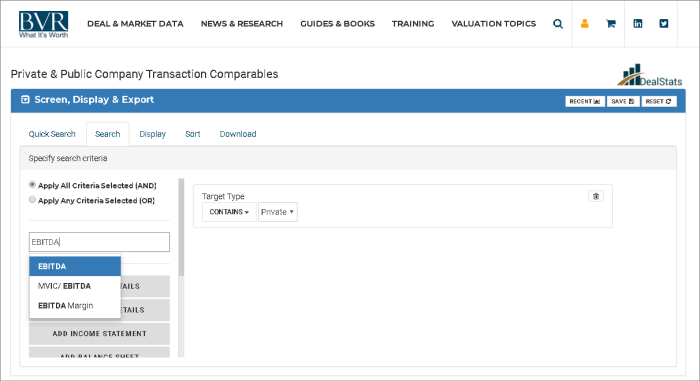 You can now identify and select comparable transactions much more easily than before. Plus, the search capabilities are much more powerful. “DealStats allows you to search on any field in the database,” says Manson. “While Pratt’s Stats limited searches by predetermined fields, DealStats takes searches to the next level with easy saving options for searches and search layouts” (see Exhibits 1 and 2). Enhanced search functionality lets you specify terms such as “greater than,” “less than,” “between,” “equals,” “does not equal,” and so on, Manson points out. And now, instead of having to go back and forth after changing search criteria, DealStats instantly displays the new transaction results. Also, you can now save your search results and return to them at any point in the future—one of the most frequently requested features from users! 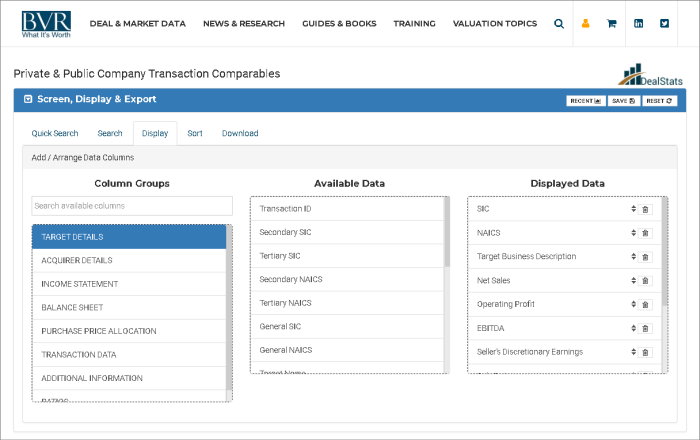 There are no longer any caps on transactions or statistics—and you can select multiple industries at one time. New data fields. DealStats includes 15 new data points, including the lives of intangible assets and additional profit margins not previously provided. Real-time updates. DealStats is updated in real time as transactions are entered. Pratt’s Stats was updated manually once per month. Customized views. You can now customize the fields you want to view and analyze (see Exhibit 3). Easier downloads. With Pratt’s Stats, you needed to export every field, but DealStats allows you to download all the available fields, or you can select just the ones you want. Graphic presentation capabilities. 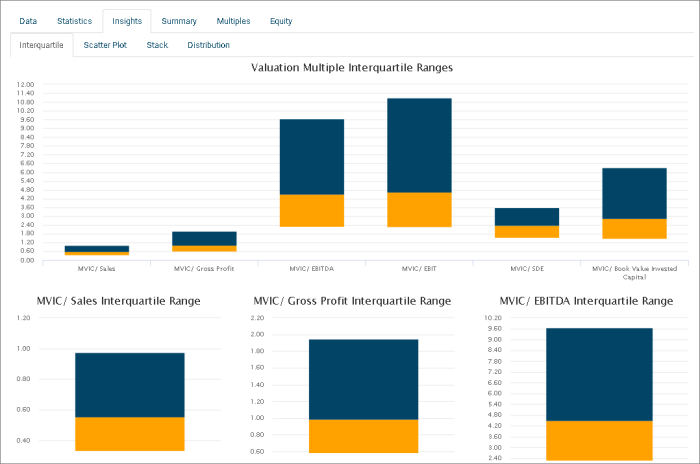 You can visually analyze selected data through interquartile ranges, scatter plots, distribution graphs, and stacked bar charts (see Exhibit 4). Easier reports. Pratt’s Stats limited the amount of reports you could generate at one time. With DealStats, you can now generate PDFs for as many transactions as you want with just one click. Companion guide. DealStats has a companion guide that contains useful information, such as how to choose comparable companies, how to select and apply multiples, and how to utilize/search the online DealStats platform. “I think it’s important to note that this is the beginning, not the end—we already have a list of additions, upgrades, and enhanced functionality that we’ll be bringing to the platform. Stay tuned!” says Manson. For more details, visit bvresources.com/dealstats and register for our free DealStats webinar on August 9 to see a live demonstration of the new platform.